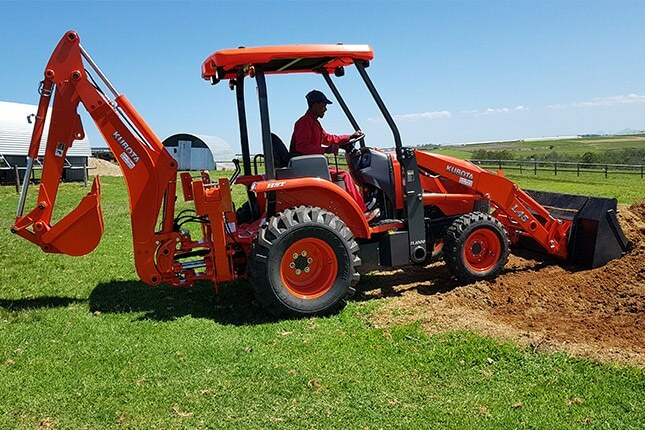 [Johannesburg, 18 October 2017]: In a capital investment decision the owner terms a ‘natural choice’, 2Hire, a Western Cape-based plant hire company, has taken delivery of a new Kubota L45 TLB from Carlu Trekkers, the authorised distributor of Smith Power Equipment, the sole importer of the Kubota range of equipment in South Africa. The L45 is said to be a radical redesign and upgrade of the previous model. The real game changer on this machine is the new Kubota HST Plus hydrostatic transmission which replaces the conventional Glide Shift transmission (GST) on the predecessor model, the well-known L39. The L45 is also powered by a four-cylinder Kubota diesel engine which generates 45 gross horsepower (hp), compared with the 3 cylinder, 39 hp on the previous model. With 1,6t of breakout force, the L45 has a lifting capacity of 1 t at a maximum lifting height of 2,8 m. The hydraulic pump flow has been increased by 12%, resulting in smoother, more powerful performance, while maintaining the superb fuel consumption.